It’s a bold look. The simple white shirt and black tie contrast with the busy pants. Interesting look. I would prefer the pants to be a tad longer though. Is Tom Hanks in New York? 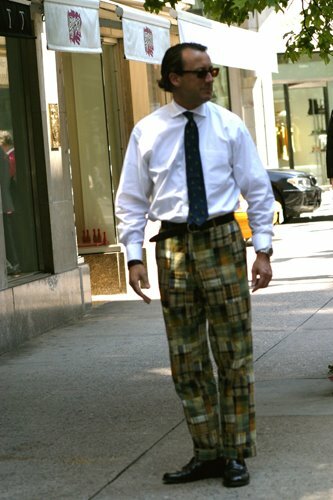 I like his take on wearing madras trousers. As if he took off his suit trouser and threw these on (leaving on the shirt/tie and shoes). If it was not jeans, or old chinos, it was madras. Dressy/Casual. Hmmm, I’m not sure of the black shoes. Perhaps loafers instead? It looks hideous and really, really great at the same time. Madras is, apparently, the big trend this summer. I wonder if he’d be wearing them if this weren’t the case? No matter, he’s a sight to behold. madras no more…old navy has colonized these guys for summer and soon you won’t be able to bear the sight of them. it definitely takes coconuts to step out like that – and I respect him for it. Woah, those trousers … I think they’re giving me a panic attack. Looks like Army camouflage to me. I’m withholding comment until I see the pattern of his tie. This guy pulls off madras without even a wiff of Old Navy or J.Crew. Quite amazing, really. So Madras is “the big trend this summer?” Haven’t these been around forever? I remember from the 80s in Boston. Either way, love ‘em – in the same category as seersucker. For some reason I feel like he is channeling Bruce Willis and it is frightening me. Bruce is a tough dude, but when paired with Madras, let’s just say I’m not “die hard” for this look. I am not sure about this one. If he had paint splattered all over the madras pans, wore a man’s t-shirt, and SoHo painter’s boots, I might like them more…but then, I don’t hate the look, either. the pants are wearing him, not the other way round. whoa, that’s quite a look. just wish he would loosen his belt a teeny bit. Anon nailed it when he said Old Navy has landed. However this guy is still enough ahead of the curve to pull it off, and it’s pants, not a poorly fit short sleeve button up. Fresh. That’s it…I’m digging out my copy of ” The Official Preppy Handbook”. This ain”t no party, this ain’t no disco …this ain’t no foolin’ around. Ralph Lauren’s… I love it!!! What a lesson of style and bolderness. A man who dare with those pants has a great personalyty. Congratulations. ok, i am really mad about the old navy thing. i’ve been rocking madras in unexpected ways for the past 10 yrs. i was wearing a pair of brown/green madras widelegged drawstring pants when i met my husband. lucky, lucky. that said, i agree with what this guy is doing with his. it’s stuffy and casual at the same time. he probably makes watches or something. The guy looks a little uptight to be wearing them. I see madras as a more relaxed preppy look. its interesting though but not my taste or style. Looks like all business on the top and a party on the bottom. Same as the popped collar. Some people can do it and others look foolish. I agree, madras are more casual and laid-back. That shirt buttoned to the top and the thin black tie are far too formal. Couple madras pants with Sperry Topsiders and a Ralph Lauren polo. Depending on the series (Blake, Regeant, Classic, Oxford or Yarmouth) a Ralph Lauren button-down will compliment very well. Very daring – I wonder how this outfit would work in it entirety (with coat). Looks amusing and witty, as a corruption of a conventional suit. Well done.